The Royal Ballet’s Woolf Works will be relayed live to cinemas around the world on 8 February 2017 at 7.15pm (GMT). 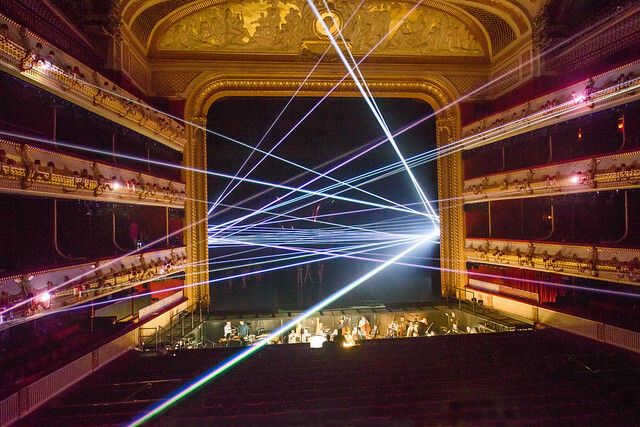 Wayne McGregor’s critically acclaimed ballet triptych is set to music by British composer Max Richter and is inspired by the works of Virginia Woolf. Sign up to access the Woolf Works Digital Programme for free (using the promo code FREEWOOLF) and enjoy a range of specially selected films, articles, pictures and features to bring you closer to the production. The cinema relay will be presented by Former Principal of The Royal Ballet and 'Strictly Come Dancing' judge Darcey Bussell and BBC broadcaster Clemency Burton-Hill. Each act of the ballet draws on one of Virginia Woolf's best-loved novels – Mrs Dalloway, Orlando and The Waves – as well as extracts of her autobiographical writings, to capture her unique way of representing the world. Max Richter is one of McGregor’s longstanding collaborators: together the pair have worked on the ballets Infra and Kairos, and on the chamber opera Sum. For Woolf Works, Richter combines orchestral forces with electronics to create a score that shifts between mesmerizing, perpetually unfolding musical material and thrilling surround sound. Woolf Works was McGregor’s first full-length work for the Royal Opera House main stage. Receiving rapturous acclaim after its premiere in 2015, the ballet returns as part of the continuing celebrations to mark McGregor’s tenth anniversary as Resident Choreographer of The Royal Ballet. The piece brings together a unique creative team, including dramaturg Uzma Hameed, architectural studios Ciguë and We Not I, designers Lucy Carter (lighting), Ravi Deepres (film), Chris Ekers (sound) and Moritz Junge (costume), and make-up artist Kabuki. Deeply engaged with a wide range of art forms, Woolf was particularly fascinated by dance and absorbed its language into her creative process. Her writings, imbued with movement and feeling, have in turn inspired Wayne McGregor in his creation about her life and work. This performance involves a wide range of Principals and corps de ballet dancers and the return of former Principal of The Royal Ballet Alessandra Ferri. Woolf Works opened on 8 February 2017. Read audience reactions to the opening night and add your own review. After the relay, we will publish a roundup of audience tweets, so share your thoughts with the hashtag #ROHwoolf. Woolf Works will be broadcast live to cinemas around the world on 8 February 2017. Find your nearest cinema and sign up to our mailing list.